The black plum tree is a stone fruit variety that can be propagated through seed collection. Collect the seed, also called a pit, by removing it from the center of the fruit and laying it out to dry. The seeds require a cold stratification period prior to germination. Plant the seed outdoors in the late fall for a natural stratification or stratify the seed indoors and plant in containers the following spring. 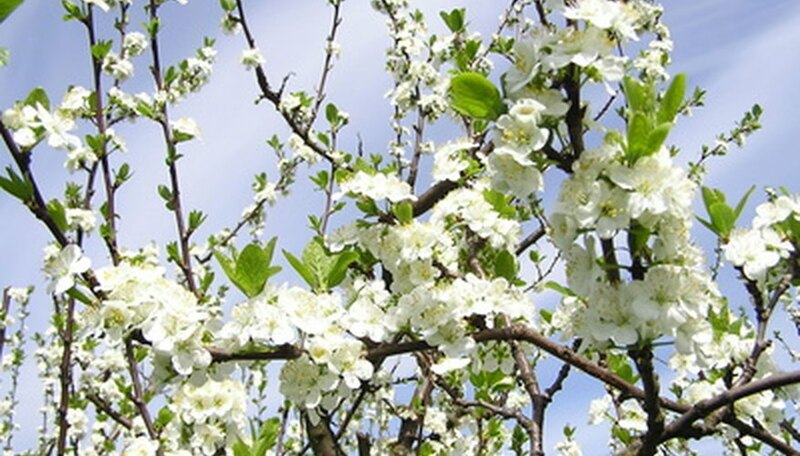 A seed propagated black plum tree will not produce fruit for five to seven years. Stratify the black plum seeds in late fall or early winter by placing them in a refrigerator that has a temperature of 33 to 41 degrees F for three to four months. Prepare a planting medium by mixing equal portions of course sand and sterile peat moss. Lightly moisten the medium and fill 4-inch potting containers that have bottom drainage holes. Remove the seeds from the refrigerator and sow them in prepared containers at a depth of 2 inches. Water the soil after planting. Continue to water the seeds to keep the soil evenly moist during the germination period. Place the planting containers in a warm location that has direct sunlight at least six hours during the day. Let the seeds grow until they reach a height of approximately 12 inches. Transplant the black plum seedlings in an outdoor location the following spring. Make sure the location has well-draining soil and full sunlight. Plant the black plum seed outdoors at a depth of 3 inches in the fall season. Lightly water the seed and let it naturally stratify in the soil during the cold winter months. Place a piece of mesh wire at the time of planting just under the soil above seed. This will prevent rodents from damaging or stealing the seed. Remove the wire mesh once the seedlings appear, taking caution to not damage the seedling. Grow the black plum seedlings in the planting location during the first growing season. Separate the young black plum saplings in the spring of the second growing season if several seeds were planted in the same area. Transplant the saplings to permanent growing locations that offer well-draining soil and full sunlight.